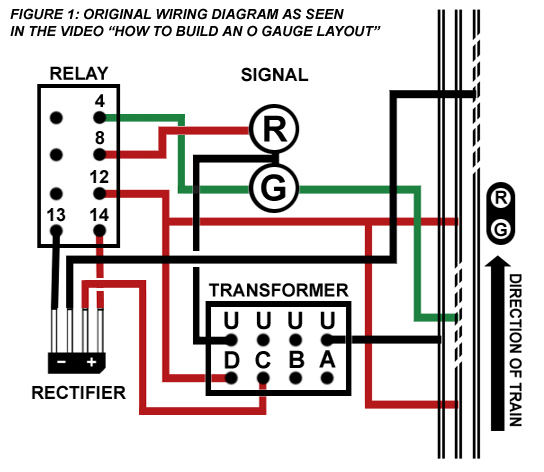 When we produced the video Building an O Gauge Layout, we included a segment on using a simple block system utilizing common electronic components found at Radio Shack. We have found this system to be very reliable, and it adds some realistic dimension to a model railroad. Below is the schematic wiring diagram for the automatic block system we installed on the layout. Perhaps all the wires and unfamiliar components will look a bit intimidating. It might help to know what exactly the components are for and why there are this many wires. In any case, this is a very affordable and simple set-up that takes better advantage of a 3-rail track system. You already understand what a transformer and block signal do. The relay is a DC-powered mechanism that alternately completes one of two circuits when activated. A 153C contactor does the same thing. But where a 153C relies on the weight of a train to be activated, a relay relies on an electrical circuit via an insulated outer rail. This is a much more reliable means of activation than trying to adjust a spring-tensioned plate to the varying weight of a passing train. Because the relay is DC-powered and we use AC transformers to power a layout, the AC current going to the relay must be rectified to DC. AC to DC conversion happens every time you sound the whistle of a locomotive. This is toy train technology that dates back to the prewar era. In this case, the installation of a rectifier between the transformer and relay is basically the same thing as standing at your control panel with your finger on the whistle button the entire time. As for the amount of wires indicated in the diagram, the key is the center rail power line, which begins at terminal post D on the transformer. As you can see, this line feeds into the track. But terminal post C provides power to the relay/rectifier. This is a fixed voltage source for operating accessories. The black wires are easy. They are used for ground throughout the layout on all powered components, including track and accessories. Now, if you're feeling a little more confident of creating and installing this system, and want to take one or two extra steps, there are easy and slightly different wiring possibilities that can be more beneficial to the operation of your layout. The relay happens to be a double-pole/double-throw switch*. This means that two different switches are simultaneously thrown that break two different circuits while completing two other different circuits. The original wiring diagram calls for the block signal lamps to be powered by the track power (terminal D). This means that variable adjusting of power from the transformer as you run your train will be seen in the color aspects of the signal. Generally, it is preferable to power both illuminated and operating accessories from a constant voltage source. Running passenger cars with the original wiring diagram also causes an issue. Passenger cars usually have center rail pick-ups on both trucks which are usually wired together. While this won't interrupt the operation of the trains in the block system, it makes the signal operation somewhat haphazard. When each car individually enters the block, the truck running over a powered center rail carries current through to the other truck running over the insulated rail, effectively acting as a jumper between the live center rail and the insulated one. The green lamp on a block signal will in turn flash on and off as power is intermittently being carried to the insulated rail via the trucks. So what we're going to do is have the signal lamps powered by constant voltage (terminal C) while the track remains powered by variable voltage (terminal D). 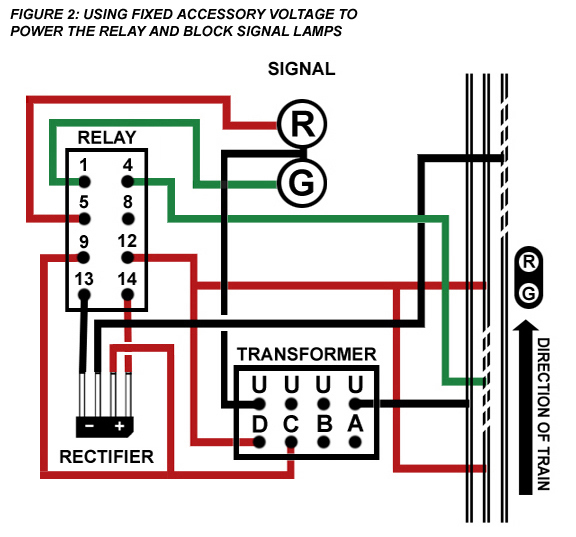 Separating the block signal lamp power from the variable track power also eliminates the issue caused with running passenger cars through the block system. Now, in this day and age of using a modern era control system such as Trainmaster Command or LEGACY, all bets are off. Part of the operation of those modern systems relies on a locomotive being constantly powered and the stopping of the train occurs through the remote control unit to brake or change direction. Because of this, the power interruption that is necessary for the block system makes it incompatible with command-equipped locomotives (unless you lock them in forward and disable the command base, effectively making the locomotives "conventional" engines). Besides, Trainmaster Command Control provides a different kind of realistic operation. In a TMCC environment, the engineer is responsible for stopping his train at a red signal, just like on a real railroad. Lashing-up two or more powered locomotives also creates a problem. Double-heading a consist through this block system means that when the train enters the block, the first engine activates the relay which in turn cuts power to the second engine. This immediately creates considerable drag. Therefore, it is not feasible to use lash-ups in this automatic block system. But a single train headed by a command-equipped locomotive will operate without any problems through the block system. Nevertheless, you may want to install manual power switches to de-activate the block system (such as running a train in reverse). A single-pole/double-throw switch is what you need. You can purchase these at Radio Shack, or get Postwar Lionel's 148-100 switches (364C switches are more common and will work IF you notice on the underside three terminal connection points instead of two). You can install the switches in the general area of each block along the layout edge, or on your control panel (which is my preference). Even if you've already installed the automatic block system using the initial wiring diagram, this procedure should be very easy. In Figure 3, where the green wire from the green lamp of the block signal originally went directly to the insulated middle rail, now the connection is severed and each end of the wire is connected to two terminals on the single-pole/double-throw switch. The line coming from the insulated middle rail should be connected to the center terminal. A wire from the center rail of this loop should then be connected to the remaining terminal on the single-pole/double-throw switch. When the switch is flipped one way, the insulated block system is enabled. 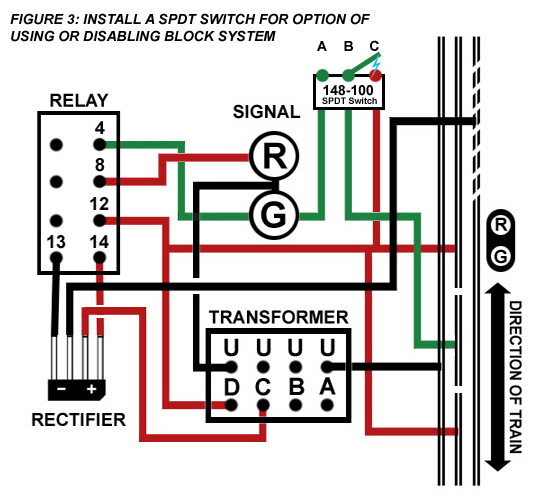 When the switch is flipped the other way, as is demonstrated in the diagram, the relay is now being used only to activate the block signal. The insulated middle rail in the block is now constantly receiving track power along with the rest of the layout. A train will run through without interruption and the block signal will indicate red or green accordingly. Finally, in the following diagram, we have all the elements of improvement from the original schematic incorporated. Note that the signal and relay/rectifier are now getting power from separate fixed voltage sources. In the video we mentioned that it is preferable to have your operating accessories and illuminated accessories on different power terminals. This is because when an operating accessory is activated, there is a discernible drop-off in voltage within that power source. In other words, if you have your illuminated accessories such as stations and street lights on the same power terminal as crossing gates and coal loaders, you will see the lamps dim whenever a gate is activated or a coal loader is being used. To avoid this, simply separate the power sour ces of illuminated accessories and operating accessories. Since the rectifier is basically an operating accessory (a small electro-magnetic coil is used to complete the circuit of the red block signal lamp while interrupting the circuit for the green lamp and insulated center rail in the block system), we'll use the operating accessory terminal as the power source. The block signal lamps will be powered from the same illuminated accessory terminal as the stations and street lights. 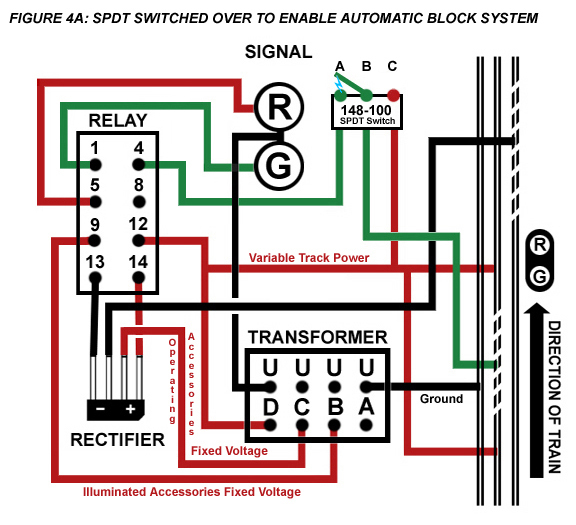 The inclusion of the 148-100 switch gives us the option of either using the automatic block system for multiple train operation (headed by single conventional locomotives with E-units locked in forward) or disabling the block system while the block signals continue to indicate when a train is in the block. 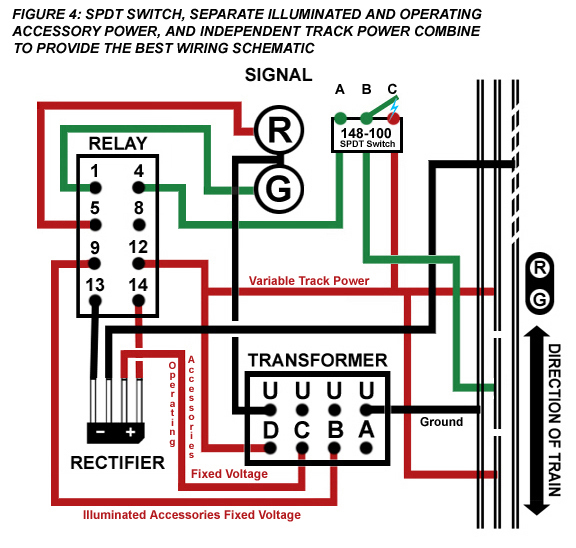 This final wiring diagram (Figures 4 and 4A) is the one I would recommend everyone use. But the original one is fine, just remember there are some operation limitations with it. A lot depends on what equipment you want to run and whether you may sometimes prefer not to have the automatic block system enabled. Single-pole/single-throw -- A simple on and off switch. These are used with accessories such as the 362 barrel loader and 397 coal loader. A 145C contactor is another example. The modern era Lionel SPST switches are Nos. 5901 and 5903. SPST switches have no purpose in the applications discussed in this article. Single-pole/double-throw -- A switch that either completes or interrupts one circuit, while simultaneously doing the opposite operation to another circuit. This is also called "changing over." The red lamp of a block signal being turned on while the green light is being turned off and vise-versa is an example of this operation. Double-pole/double-throw -- Two separate switches are concurrently activated, simultaneously completing two separate circuits whilst two other circuits are interrupted. Again, refer to Figures 4 and 4A. Posts 9 and 12 on the relay represent two separate power sources, or poles. Posts 1 and 4 are normally completed circuits (also known as normally closed) and posts 5 and 8 are normally open. The activation of the relay opens the circuits of posts 1 and 4 while completing the circuits of posts 5 and 8.